The ex-England international suggested Liverpool should look to take advantage of the striker’s injury yesterday. 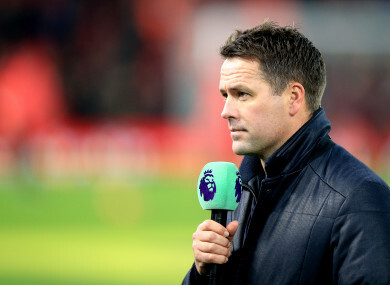 MICHAEL OWEN HAS hit back at the “angels” condemning his claim during Manchester United’s clash with Liverpool that the Reds should “go and kick Marcus Rashford on the ankle” he injured early in the game. Rashford was clattered by Jordan Henderson in the opening exchanges, which left him hobbling around the field. It appeared that United would be forced to replace Rashford, but he ended up having to stay on the field as others tumbled around him. Ander Herrera, Juan Mata, and Jesse Lingard all came and went for United inside the first half, while Roberto Firmino presented Liverpool with an untimely injury headache. With Rashford forced to stay on despite being a long way short of full fitness, Owen suggested that Jurgen Klopp’s side should look to take advantage of that. As part of his punditry, the former United and Liverpool striker said as the sides emerged for the second half: “I tell you what, if I was Jurgen Klopp in that dressing room at half-time with Manchester United not being able to bring on another substitute, I’d be saying ‘Right, first person, first opportunity, go and kick Rashford on the ankle that he has been limping on’”. Owen saw his comments widely condemned on social media. As someone who endured his fair share of injuries during his own career, it was pointed out to the ex-England striker that he should not be wishing ill on others. The 39-year-old insists that was never his intention and claims he was merely pointing out what would have been discussed inside the Liverpool dressing room in an effort to gain the upper hand. He posted on Twitter: “Hadn’t realised there were so many angels here on twitter. For everyone in uproar over my comments yesterday, get real. As an ex-player I am employed to give my views and insights into what happens at football clubs all over the land. United manager Ole Gunnar Solskjaer was not too happy with the rough treatment he felt Rashford received against Liverpool, but was quick to hail the 21-year-old’s fighting spirit. “Marcus is a warrior and he’s a Manc and he knows what this game means. “We had to keep him on, because we already had to make three subs. It seemed like it was their plan, to just kick him, because they kept kicking him from the first minute. “If that’s not an accumulation of fouls I don’t know. But he stayed on. His ankle is like a balloon, so it was a fantastic attitude by him. Email “Michael Owen responds to backlash over his ‘go and kick Rashford’ comments”. Feedback on “Michael Owen responds to backlash over his ‘go and kick Rashford’ comments”.